I have eaten myself into a stupor. Not only are these amazing Vegan Butterbeer Brownies so chocolatey that I can’t even handle it, but the deep notes of butterscotch and hint of vanilla…I’m dying. 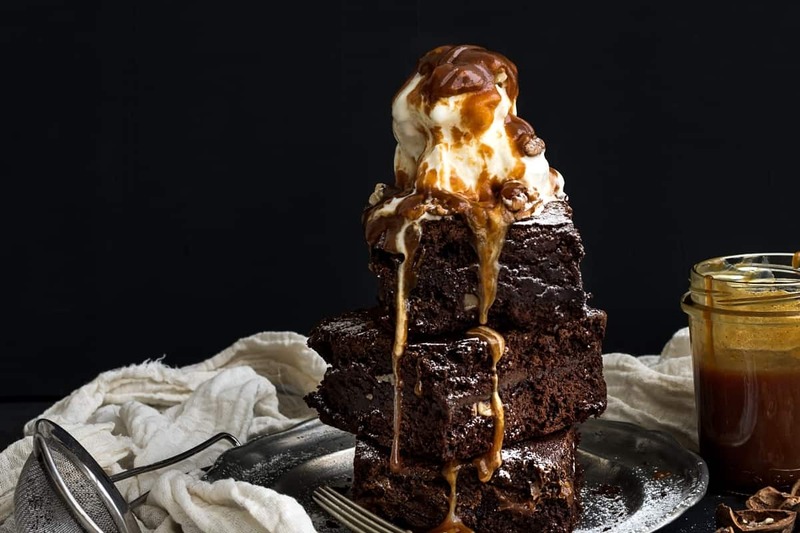 You just don’t even know how magnificent it is to make a tower of brownies, all drizzled with a thick butterbeer drizzle and topped with butterbeer ice cream. Until you’ve done it. And then you sink your fork in to that tower and place that overtopped fork in your mouth. It’s like a dance-party happened on my tongue–and I loved every second of it. And, silly me, I kind fo snuck-in some pecans, too, which you’re also welcome to do when you make your own Vegan Butterbeer Brownies. But, it’s totally not required. Please don’t feel like I’m pushing pecans off on you–I’m not. It’s just that I had some laying around and they weren’t going to be used on anything for a whole ‘nother year (like until I need to make another pecan pie, for instance), so I might as well throw them off on this easy Harry Potter dessert. But, totally not required for maximum enjoyment. I mean, you can never have too much amazing yumminess, but you’re not required to add nuts. 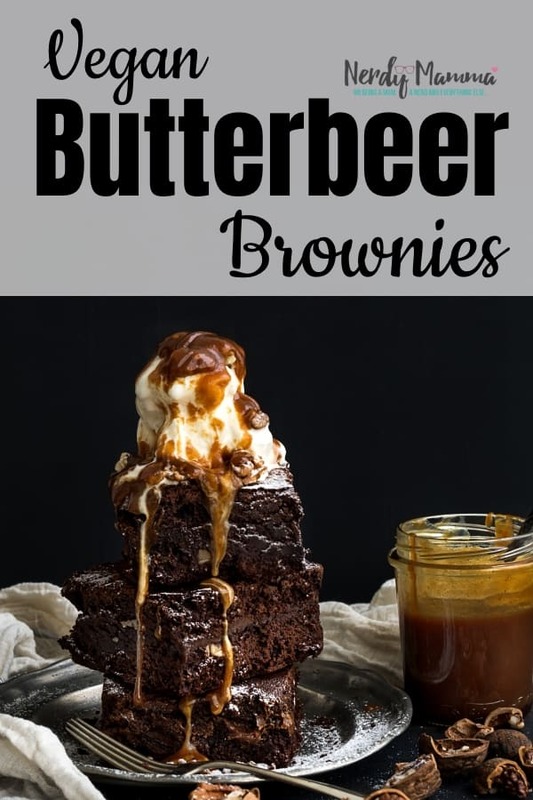 If you’re dying to make your own Vegan Butterbeer Brownies, but you don’t have your vegan chocolate chips (I always keep these in the pantry because they’re amazing and work just like those nasty dairy-full chocolate chips I used to bake with) on hand yet, be sure to pin this recipe so you can come back to it when you’re ready! 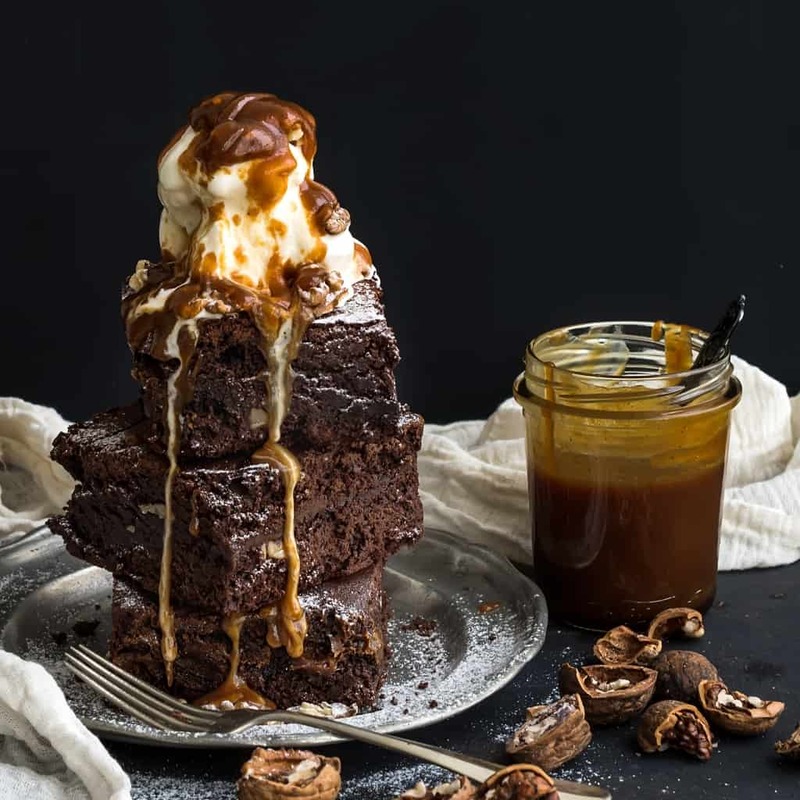 If you want to have an overload of amazingness in your mouth, you have to make these Vegan Butterbeer Brownies. Harry would be jealous. Place the coconut sugar, salt and vanilla in a pot over high heat. Separate in half--refrigerating one portion. Grease your 9x12 baking dish. Set aside. Add melted chocolate chips--and the un-refrigerated half of the butterbeer drizzle to the batter and stir until mixed thoroughly. Immediately pour the remaining butterbeer drizzle over the top in sticky, long pours. Allow to cool to the touch, then cut in squares and garnish with Butterbeer Ice Cream.